Iridium oxide (IrOx) was electrodeposited onto glassy carbon electrode applying two-step potential cycling procedure. 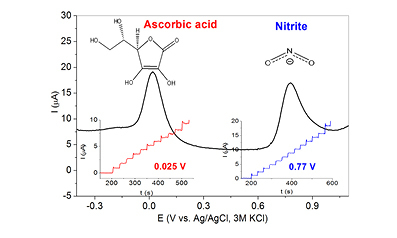 The electrocatalytic properties of the modified electrode IrOx/GC were evaluated with regards to electrochemical oxidation of nitrite and ascorbic acid (AA). The developed electrode-catalyst have been extensively studied by various electrochemical techniques. Differential pulse voltammetry (DPV) experiments indicated that the modified electrode possesses excellent electrocatalytic activity towards the oxidation of both nitrite and AA in neutral medium and offers simultaneous quantification of these substances. Constant potential amperometry studies also were performed – the IrOx/GC showed sensitive response to nitrite (159.7 μA mM–1 cm–2) with a wide linear range from 0.002 to 10 mM at 0.77 V (vs. Ag/AgCl, 3 M KCl), and to AA (96.2 µA mM–1cm–2) with a linear range from 0.01 to 3 mM at 0.025 V. The detection limit was 0.63 μM nitrite and 4 μM AA, respectively, and both of them had fast response within 5 s. Considering the simple and rapid electrodeposition procedure for preparation, IrOx/GC is a new electrode-catalyst for sensitive and selective quantitative detection of nitrite and AA. The wide linear range, good selectivity, reproducibility of the amperometric response and long-time stability of the IrOx/GC make it a promising sensing material for practical nonenzymatic quantitative detection of nitrite and AA.